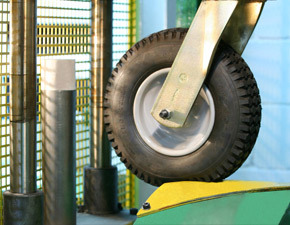 In order to determine the number of castors or wheels you will require, several factors must be taken into account: unloaded weight, maximum load, number of castors or wheels and working conditions. The working conditions, floor surfaces and conditions are very important elements that must be taken into consideration when calculating the load capacity. This is especially true of uneven and rough surfaces which can easily overload three of the tour castors. With this in mind, a definition of standard conditions would be a surface on which castors are not overloaded, receive no impacts and which is smooth, non-abrasive and free of obstacles, cracks, grooves, doorjambs, nails, etc. The safety factor is used when conditions vary from standard. This varies from 1•3 to 2 depending on the actual conditions encountered. All load capacities in this catalogue have been calculated according to European Materials Handling Standards: EN 12528 and EN 12533.